This week, we’ve been over at Greenwich & Lewisham Young People’s Theatre delivering a workshop called Spark Change Through Play. Guided by Coney Associate Michelle McMahon, with sessions from Coney makers and Associates David Finnigan, Kieran Lucas, Tassos Stevens and Segen Yosef, and support from Ting-chi Chuang, our team of young makers have created a playful performance around change and identity. We’re hugely proud for the piece they’ve made to premiere at The Tramshed in Woolwich, followed by a short run at The Albany. Catch their opening night tomorrow as curtain raiser for a new piece by Bertrand Lesca and Nasi Voutsas – tickets are available here for just £3. We caught up with young makers Esme Cooper and Lina Kabbadj about their experience of making a show in a single fast-paced week. Lina is a marine biologist turned science communicator, while Esme is a creator and actor of immersive theatre with a main passion in exploring combining games and Stage Combat to create interactive fighting. Esme: Madness. Exciting madness. We’ve been exploring identity, and how we’re linked to the world and the environment. We’ve been looking at systems and how they can create games. And we’ve also been looking at what we’re personally interested in – Lina is interested in the environment, while I’m interested in fight dynamics and how you can place games within them. Lina: It’s been unpredictable and fascinating. 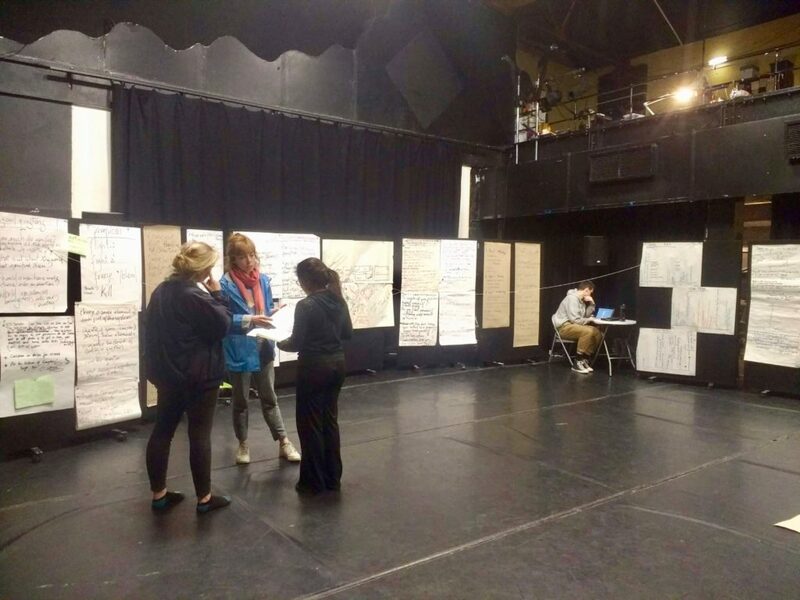 Our objective starting out was to create an interactive performance exploring the ideas of identity and politics and how we can achieve change. We started with identifying the questions we were interested in exploring, then from there we selected some that we could all agree on. Each day we had visits from different people, with Michelle here every day to guide us through the process. What’s been a highlight of the process so far? Esme: One of my highlights has been how much fun we’ve had. We haven’t just been sat in a room just chatting for hours – we’ve been playing games, exploring different ways of working with all the people who’ve come in to help, and we’ve had a massive laugh as well. It’s been a really interesting, unique week. Lina: The devising process can feel like a very weird one, not knowing where you’re going, but strangely it’s a process I felt like we could trust; it seems a really worthwhile journey. And I was totally blown away by David‘s session on understanding systems. Have you had any big surprises along the way? Esme: Every time we take a step forward I’m surprised! A lot of this process has been a surprise. David’s work on systems was new to me, and the way Tassos and Segen approach gaming is really interesting. I come from an immersive/interactive theatre background, and the way they approach interactive theatre is very different from a lot of people, which I’m fascinated by. And the fact we’ve got a show is a mildly surprising thing as well. Lina: Where to begin? There’s the skillset of people here – I had no idea who I would be working with this week, and things like Esme’s fighting knowledge and experience of sailing are completely random but super interesting. Also, using English as a second language I often find myself having to explain what I mean, but weirdly I’ve found that many things I thought were unclear were understood by Esme and Michelle. I’ve been surprised by how well communication has flowed, and how clear the directions from the other people who came and helped us were. How have your own backgrounds and skills fed into the piece you’ve built together? Esme: For me, probably more than I wanted! I was going to try and leave them behind and explore new stuff but it’s fascinating to see how one of your skillsets can have a large influence on a show without meaning it to. I believe a show is created by the people in the room, and if one person is different you’ll get a very different show. I think this piece is very unique to Lina too – I’ve learnt a lot about marine biology and biodiversity through working with her. Lina: I trained as a marine biologist, then I realised we need to communicate science way better, so I’m now working in science communication. I came to do this workshop because I attended Coney’s performance of How We Save The World at the Natural History Museum and I really liked the way it made the audience feel that nothing is determined in advance. Plus, I knew Michelle had directed that show, so I had faith that she wouldn’t let us ruin people’s evening with our own! I didn’t come into this process as an opportunity to make an environmental play, but obviously that background comes out when you’re asked what you care about. It’s interesting to see that in the end we were encouraged to put more of ourselves into it. In a sense that’s more truthful, and it’s easier to act out a fiction that’s close to who you are. What question or provocation will you take away from this week? Esme: I’ve got two. First, how I can use what I’ve learnt here to feed into my own work afterwards. And second, how the hell do I get an audience to do interactive stage combat with no prior experience onstage? I still have no idea about that one. Lina: I’ll take away something Michelle said at the beginning: the performance doesn’t necessarily stop when we go home, but only when the conversation stops. I want to tell too much sometimes, but rather than thinking ‘I have this amount of time and I need to put as much as I can in it’, the best way to get people to ask questions is by taking the show as a first step and considering what will make it more likely to go far. Don’t miss Esme and Lina’s show which premieres tomorrow as part of GLYPT’s CHARGED mini-festival tomorrow, 6 April at 7.30pm – tickets are £3, available here. There will be three more performances at The Albany as a curtain-raiser for Sounds Like Chaos, 16-18 April 7.30pm – book for those here. The performance at The Tramshed is BSL interpreted.